Said menu is split into three different types of dish: snacks priced at €7.50 each, including things like rillettes and crudités; regular dishes priced at €10-15, including classics like foie gras, frog’s legs and French onion soup; and specials at lunch or dinner – think croque monsieur and steak tartare. Blaauw’s Parisian branch has a well-stocked bar, too: I’d recommend kicking off with an aperitif at the steam-punk-esque bar before making your way to the table. 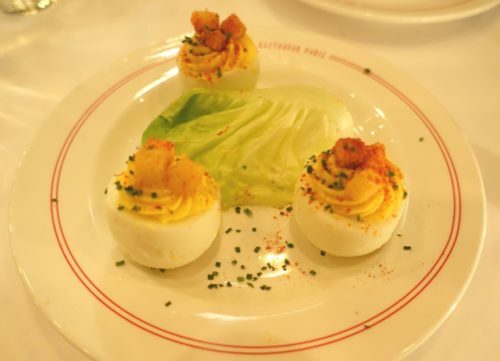 We nibbled on some oeufs mimosa to start: devilled eggs stuffed with their mustardy, creamy yolks. Simple yet polished – although the mustard for me held slightly chemical undertones. Next, a whole artichoke came with two dipping sauces for the leaves: a sort of salsa verde/herb oil and a mustard vinaigrette. 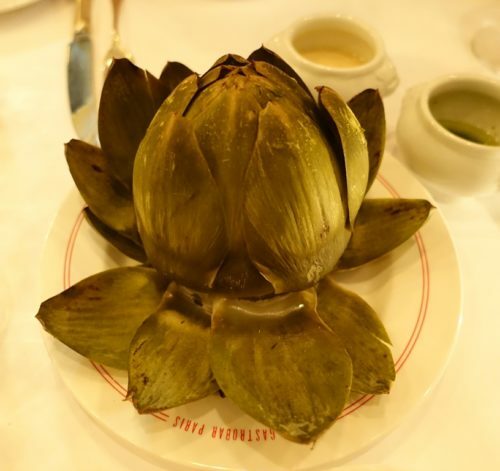 A whole artichoke is a beautiful (if fiddly) thing to eat, and peeling back layer after layer to reveal the earthy heart reminded me of being 12 and visiting my brother in Brussels. 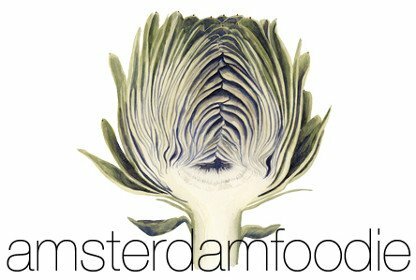 He introduced me to my first artichoke, and that experience is arguably the reason the Amsterdam Foodie’s logo became an artichoke a decade ago. Our hot dishes arrived in cute little Le Creuset-style pots. Boudin noir (aka black pudding to the Brits) came with caramelised apple, onions and lardons in a meaty gravy. Meanwhile, the cassoulet didn’t much resemble the Provençale variety I’m used to: it was heavy on mustard (Ron Blaauw seems to love mustard!) and the sausage tasted more like a smoked Dutch sausage than a Toulouse sausage. 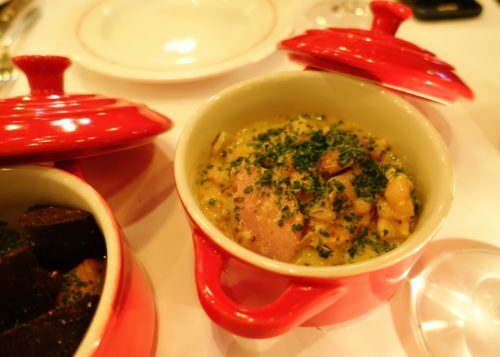 All that being said, I liked it – it just wasn’t the way I’d make cassoulet myself.